Fit or Fitted – What’s the Difference? Home » Fit or Fitted – What’s the Difference? Differences between American and British English are sometimes surprising, and they range from differences in spelling conventions to verb inflection. Fit and fitted are two past tense conjugations of fit. Each is correct but is used within a different language community. 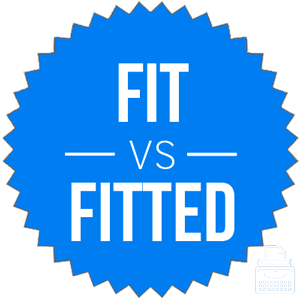 What is the Difference Between Fit and Fitted? In this post, I will compare fit vs. fitted and outline when you should use each conjugation. I will also use each of these words in at least one example sentence. This way, you will be able to see each word in its proper context. Lastly, I will show you a mnemonic device that makes choosing fit or fitted in your own writing much easier. What does fit mean? Fit is a verb that means to be sized correctly or able to be worn comfortably. In American English, fit is usually conjugated in the following ways. In this article, I will be concerned primarily with fit as the uninflected past tense conjugation of the verb. See the following sentences for examples. Jen gave her old red shirt to her little sister, since it had never really fit her anyway. Josh had to return the dress shirt his mother had bought him for Christmas because it did not fit. Fit can also be an adjective, where it means healthy or in good shape. I want to be like Michael because he exercises all the time and is very fit and handsome. What does fitted mean? Fitted is another way to conjugate the verb fit into the past tense. The verb is primarily inflected this way in areas of the world that speak British English. Americans usually just use fit. American English conjugation: Fit > Fit > Fit. British English conjugation: Fit > Fitted > Fitted. As you can see, American English users have clearly standardized around the conjugation fit. British English writers, however, are much more split in their decision to use fit or fitted. These charts aren’t exhaustive in their scope of written use, since they only look at books published in English since 1800. Still, they are helpful in illustrating long-term usage patterns, but they are less helpful in cases where usage frequencies are close or volatile (as is the case in the British English use of fit). The American English chart, however, does reflect the historical use of these various past tense forms in America. Fit first started seeing common, regular use as the past tense and past participle in mid-20th-century American English. Traditionally, this was seen as an error, as fitted is the traditional conjugation. Despite this fact, fit continued to see more and more widespread use—to the point that it now dominates American English. With each passing year, fitted becomes rarer and rarer. The British English chart is much more volatile over the last 50 years, so it’s hard to extract much about usage patterns. Fowler’s Dictionary of Modern English Usage, a well-known British usage guide, states, “The only past tense, past participle, and participle form in BrE is fitted.” This makes clear that fitted is still the preferred conjugation in British English. A British reader of American expository prose feels totally at home until he comes to “fit” as a past tense. This indicates that fit as a past tense started as a uniquely American phenomenon. One use of fitted that is unlikely to change is its use as an adjective. In this sense, fitted means designed to fit well. A fitted baseball cap, for instance, is made so that it fits a specific size head without adjustment. A fitted suit is tailored to the wearer’s body so that it will be comfortable and look sharp. As past tense verbs, these forms are interchangeable. Despite the regional difference in use, each word has the same meaning. As adjectives, though, the meanings are different. Fitted means made to fit a certain size. Since fit is a skinny word, and people who are in good shape are more likely to be skinny, you can easily remember that fit means to be in good shape. Is it fitted or fit? Fit and fitted are two ways to conjugate fit into the past tense. American writers use fit as the past tense. British writers use fitted as the past tense. Both of these words are also adjectives, where they mean healthy and tailored to the wearer, respectively. When using them as a verb, be sure to consider your audience to avoid unnecessary distraction. 1 What is the Difference Between Fit and Fitted? Flutist or Flautist – Which is Correct?